Great business leaders and owners are always looking for ways to grow and develop. For such businessmen who are CEOs, COOs, Directors or working at any other top positions in their own entrepreneurial or family owned business, our Leadership and Business Coaching creates a vision for where they want to be in their businesses and develop tangible strategies along with actions plans to help them get there. In our specific one-on-one coaching sessions on leadership, decision making and business management; our coaches provide the insight, experience and business acumen to the business leaders while addressing their specific needs. So if you feel there is still a room for improvement to perform better at your own workplace, Leadership & Business Coaching is the genuine solution. The content of this program is made real via concrete examples and deliberate practices. 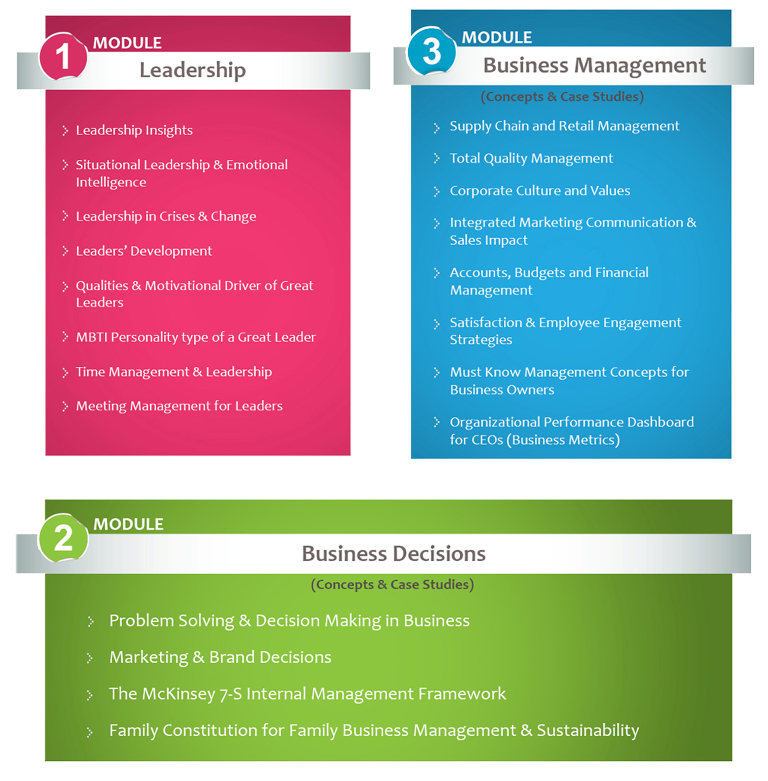 During this program, links are drawn across business areas—Leadership, Business Decisions, and Business Management. Therefore, you will be able to relate the concepts for better business understanding and for procedural execution at corporate level. * The attendees can get this program tailored as per their requirements. With the rapidly changing business scenarios – Now it’s a high time to let a coach enter for your business success..! !